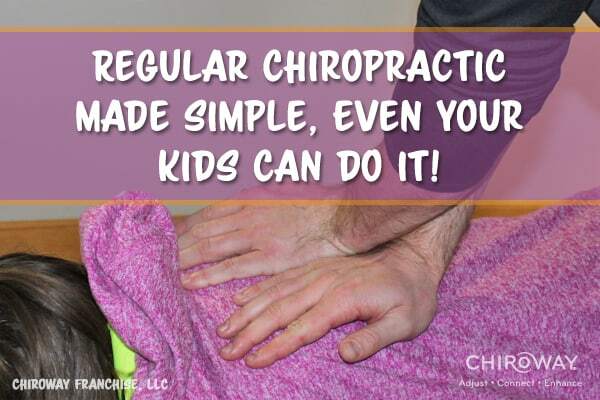 Regular Chiropractic Made Simple, Even Your Kids Can Do It! Did you know that children have been receiving chiropractic care for over 100 years? Ever since chiropractic was developed in 1895, families have been bringing their children to the chiropractor for chiropractic adjustments. In 1895, there was a philosophy, science and art established by DD Palmer and his son B.J. Palmer for the purpose of adjusting segments within the spinal column. Your highest quality of wellbeing is directed by your neurological system through communication of mental impulses from the brain to the body and the body back to the brain through the nerves. This process needs to be free of any interference in order for an optimal state of communication and increased wellbeing to take place. In a 2010 National Chiropractic Practice Analysis by The National Board of Chiropractic Examiners’-found that about 17 percent chiropractic patients were under age 18 — approximately 7.7 percent aged five years or younger and some 9.4 percent between ages six and 17. At ChiroWay, we’re passionate about helping the next generation with regular chiropractic care to help them invest in their future, as well as educating the community on the importance of chiropractic for kids. Children can develop vertebral subluxation right from the start of their life due to daily stressors and demands they experience. Parents are becoming more and more aware of the physical, chemical and emotional stress in their children’s lives that can lead to opportunity to benefit from chiropractic adjustments. By removing vertebral subluxation at a young age, it can promote optimal function, and in turn, a healthier and stronger body as children grow up. If vertebral subluxation is present in your child’s spine, it can negatively affect their general health and function. Regular chiropractic care for children is a wellness lifestyle to reach a higher quality of life. The number one questions parents ask: Is chiropractic safe for my children? If your child hasn’t experienced chiropractic care yet, ask your ChiroWay Chiropractor today about how they can benefit from regular chiropractic care! *Doyle M. Is chiropractic pediatric care safe? A best evidence topic. Clinical Chiropractic, v.14, no.3, 2011 Sept, p.97(9).